SAINT PETER—Minneapolis architectural firm Hastings & Chivetta has completed the construction of a 3,000-foot-long plastic slide from the second floor of the Southwest Apartment Complex to the entrance of the popular college bar Patrick’s on Third. The slide will only be accessible after proving senior class status via photo I.D. and passing a brief screening to confirm the rider has no remaining fucks to give. 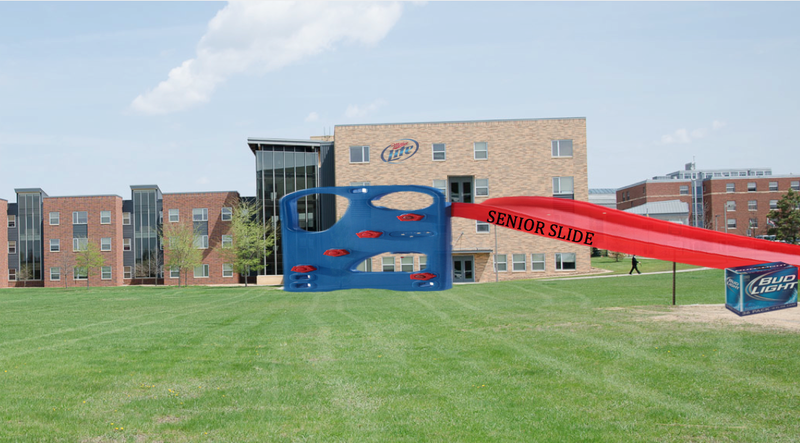 The original proposal, which included an additional route to El Agave (dubbed Señor Slide), was greatly reduced due to a lack of engagement from the senior class, which slept through most of last semester’s Saturday afternoon meetings. The opening of the slide will be marked with a ribbon-cutting ceremony on the first day of classes of the 2014-2015 academic year. Many have speculated the attendance of the ceremony will be severely compromised due to its lack of free food and distance from the seniors’ beds. The entryway to the 3,000-foot plastic slide is accessible through the Southwest apartment complex. Riders must meet a minimum BAC of 0.10 to experience the campus feature.